The heavy rain finally took its toll as referee Adrian Harris decided to abandon this Sussex Senior Cup second round tie at half-time. By this time the ball was sticking and not bouncing to the official’s satisfaction, and despite protests from both managers, it seemed to be a sensible solution. Obviously Crawley Down felt more aggrieved as they were leading the game, although Bridges had plenty of the ball. The difference perhaps was that the visitors seemed to be dangerous every time they attacked, while Bridges - despite dominating long periods of the 45 minutes - couldn’t seem to find the final ball to worry keeper Martin Hopkins and his defenders. The ever-busy Michael Campbell did see an early header cleared off the line, but it was the Anvils who stole a fourth-minute lead when a free-kick down the line was gathered by the dangerous Amaraloo Glloga who cut inside for a fine finish. 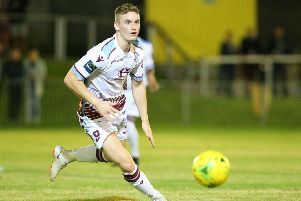 Nathan Simpson made a great challenge to prevent Johden De Meyer from doubling the tally, but Bridges showed intent with John Lansdale shooting just wide from a free-kick. But after 33 minutes a deep free-kick by Bridges keeper Kieron Thorp from just inside his own half found the excellent Nathan Crabb wide on the right. He chested the ball down and then delivered the perfect cross for Jensen Grant to head home. And two minutes later Campbell fired just over from another telling Crabb cross. But after 38 minutes a superb cross by Dan Sullivan found an unmarked Oli Leslie, who took full advantage to restore Down’s lead. Brendan Murphy McVey almost levelled with another free-kick that went just wide, but it all counted for nothing anyway with the game needing to be rescheduled after the abandonment. Three Bridges: Thorp, Collins, Simpson, Lansdale, Koo-Boothe, Crellin, Campbell, Grant, French, Murphy-McVey, Crabb. Unused subs: Siaw, Hall, Berry, Peters, Bradshaw. Crawley Down Gatwick: Hopkins, D.Sullivan, Lowe, Peauroux, Pelling, Packham, Glloga, Spence, De Meyer, Leslie, Thomas.